BY MELISSA WELCH, M.D., M.P.H. – Did you know that walking is a great way to extend your life expectancy? According to the American Heart Association, every hour of physical activity adds two more hours of happy living. This is one of the many tidbits people learned while celebrating National Walking Day in San Francisco’s Financial District earlier this week. On Wednesday, the American Heart Association kicked off a national, month-long celebration designed to help us all become more active. The pitch: take just 30 minutes to walk each day to improve your health and reduce the risk of serious diseases. 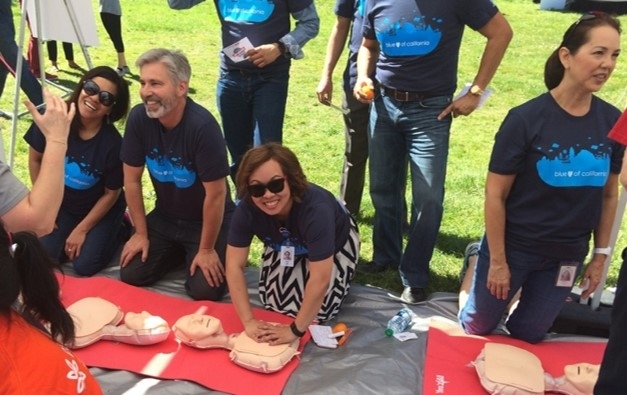 Blue Shield celebrates American Heart Association’s National Walking Day by sharing with the public about heart health and CPR. As a nonprofit health plan, Blue Shield has a responsibility to not only ensure individuals can access quality healthcare when they need it, but also to promote healthy habits in the communities we serve. Last week, Blue Shield employees shared information about the benefits of physical activity with people in downtown San Francisco during National Walking Day. Research shows that walking at least 30 minutes a day can reduce your risk of heart disease, Alzheimer’s, obesity and breast cancer, among other diseases. Too often something gets in the way of physical activity. Walking is a low-risk, easy to start activity that doesn’t require equipment. You don’t have to change your whole world – just get moving. A little activity goes a long way in keeping you healthy. For more information about the benefits of walking, you can visit the American Heart Association website.